Robomodo, the developers behind Tony Hawk: Ride, have posted some photos showing off the prototype controller used as a testbed before the final design was nailed down. 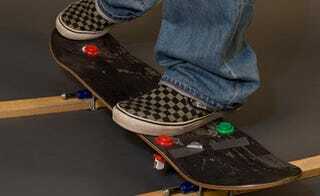 So, How Does The Tony Hawk Controller Work? And we love it! Sure, with wires, wood and buttons all over the place it doesn't have as compact a final form as the retail model, but it's dirty, raw and practical. Which seems to fit with the whole skateboarding thing a lot better than a lump of plastic with lasers.